Welcome to another Girl Scout year at Discovery World! For the first time ever, Discovery World offers a new Daisy Badge Workshop! We are excited to debut new badges for Brownies and Juniors along with our existing Cadette Badges. In addition to these workshops, we offer Private Workshops and our Satellite Program of select Girl Scout Workshops that come to you. Use the tabs under the “Girl Scout Public Programming” header. Select the desired rank and workshop and use the “Register” button to get to the registration page. Please note the date and time of the workshop you are registering for. Include full names and troop numbers. Print of email confirmation to bring the day of the workshop. Registration closes 24 hours before the scheduled start time of the workshop. If you would like to register via phone, please call the Reservations Department at 414.765.8625. Dates and times subject to change. Registration closes 24 hours before the scheduled start time of the workshop. The Great Lakes are teeming with life, even at night! Catch our exhibits after dark, touch a stingray, make fishy projects to take home, and experience “Dive into the Reiman Aquarium”, a live presentation to learn the ins and outs of our aquarium. After a fin-tastic time, wake up to breakfast and a sunrise over Lake Michigan. Each Girl Scout must attend with an adult. Adults may accompany multiple Girl Scouts. There will be separate male/female sleeping area. Please plan to provide supervision at all times. Girl Scouts 2nd Grade and up are welcome. The cost is $40/Girl Scout and $20/Chaperone. Cost includes admission to Discovery World, all program supplies and lab activities, fun patch, a snack on Friday, and a small breakfast on Saturday. Registration for these Girl Scout Sleepovers must be done through the Girl Scouts of Wisconsin Southeast. To sign up, please visit www.gswise.org. Can’t make the scheduled workshop dates? 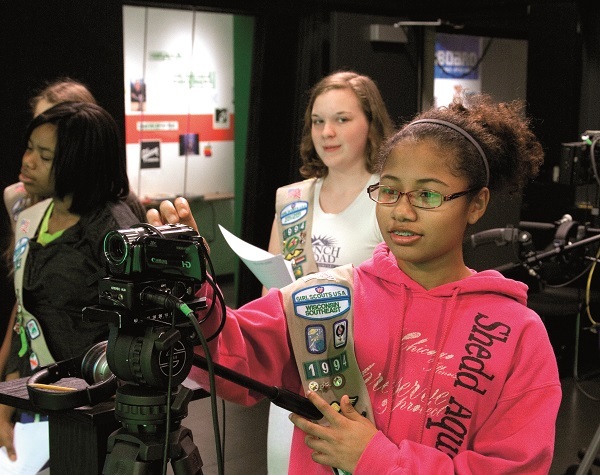 We can provide any of our workshops to Girl Scouts here at Discovery World. A minimum of ten (10) Girl Scouts is required and one chaperone for every ten (10) Girl Scouts. For more information or to book a Private Workshop, please call the Scout Coordinator at 414.765.8767. Please note that PRIVATE Workshops must be paid for at least three (3) weeks in advance. You are not registered, and your reservation is not confirmed until full payment has been received. If your troop is interested in completing a Journey, please call the Scout Coordinator at 414.765.8767 to set up your Private Workshop. Discovery World does not provide the physical awards for Journeys. Please note that Journeys must be paid for at least three (3) weeks in advance. You are not registered, and your reservation is not confirmed until full payment has been received. Offered Mondays, Tuesdays, and Thursdays, Discovery World comes to you! You provide the space, we provide the expert, materials, and experiments. A minimum of ten (10) Girl Scouts is required, a working space for each Girl Scout (tables and chairs), and one chaperone for every ten (10) Girl Scouts is required. Discovery World will bring all the necessary supplies. To book a Satellite Program, please call the Scout Coordinator at 414.765.8767. Satellite Programs must be set up at least three (3) weeks in advance. Please note that SATELLITE Workshops must be paid for at least three (3) weeks in advance. You are not registered, and your reservation is not confirmed until full payment has been received. The Discovery World Girl Scout Team will travel within a 30-mile radius of Discovery World, mileage fees apply at $.50 per mile. An extra distance fee of $20 will be added for any distance 31-45 miles from Discovery World, in addition to the $.50 per mile. Yes. Reservations must be made in advance. Registration for all workshops closes 24 hours in advance from the workshop start time. Only registered Girl Scouts of the correct age and rank will be allowed into Girl Scouts workshops. Are siblings allowed to come to any workshops? No. Siblings are not allowed to be in any workshop. Only pre-registered Girl Scouts are allowed to attend Girl Scout workshops. Who should I contact if I need to edit my reservation? If you need to edit your reservation, please contact the Reservations Department at 414.765.8625 or email reservations@discoveryworld.org. Their office hours are M-F, 8am-4pm. Refund and rescheduling policies will be strictly enforced, please plan in advance. In order to receive a full refund for any registration, YOU must cancel the reservation at least two (2) weeks prior to the Workshop date. Cancellations received less than two (2) weeks and more than one (1) week before the Workshop start date will receive a 50% refund. Cancellations received less than one (1) week from the Workshop start date will receive no refund or credit. If you wish to reschedule your Workshop reservation, YOU must notify the Discovery World Reservations Department at 414.765.8625 at least two (2) weeks prior to the start of your scheduled Workshop. Rescheduling requests received after the two (2) week window will not be accepted. All rescheduling requests are subject to availability. Will a workshop be cancelled if it does not meet a minimum attendance threshold? A workshop may be cancelled by Discovery World if it does not meet the minimum attendance threshold. In the event of a cancellation on our part, you will be notified at least one (1) week before the workshop start date and offered either a full refund or an option to switch to an alternate workshop or an alternate workshop date. Alternate workshop dates are subject to availability. If you choose to switch to an alternate workshop that has a cost is greater than the original cancelled workshop, additional payment must be submitted at time of switching. Please arrive at least 10 minutes prior to the workshop time. Check in directly with the Scout Educator at the front entrance of Discovery World near the Membership Desk. Parents/guardians or leaders must physically walk in the building to check in. You will be asked to show a confirmation email. What should we bring for the workshop? Please bring your confirmation email to check in. You may bring in a physical copy or a digital copy. Only registrants signed up for the workshop whose name appears on our roster will be allowed in the workshop. Do parents or leaders need to be present for the workshop? Parents and/or leaders are not required to stay for the workshop. However, they do need to physically check their child in and out of the workshop. If an adult would like to stay for the workshop, we kindly ask them to help out in the workshop when needed. If adults want to stay, but don’t want to be in the workshop they may sit on the promenade. If an event is going on, we may ask that parents find an alternate place to go during that time. Adults dropping off, not intending to stay, can pull up on the top turnaround drive near the front entrance of Discovery World. This is intended for adults NOT staying for the workshop and plan to leave right after checking their child in. Note that you must physically check your child in and out of the workshop. Curbside drop off and pick up is not available. Adults planning to stay for the workshop can park in Discovery World’s underground parking garage. Adults staying for the workshop may NOT remain parked in the top turnaround drive. The rate for parking in the garage will be $9/vehicle (special Scout rate). To get this rate, you must see the Scout Educator for a special parking voucher which you will use to pay on your way out. If you wish to park elsewhere, please visit www.parkmilwaukee.com for further information on alternative parking locations and rates. Do I get a badge with my workshop? No. Discovery World does not provide the physical badge for badge workshops. Is admission to Discovery World included in my workshop price? Yes, admission is included for the participant who is registered for a workshop during regular museum hours the day of the workshop only. Who do I contact if I need to get a hold of the Scout team? You can call the Scout Coordinator at 414.765.8767 or the Reservations Department at 414.765.8625. The Reservations Department office hours are M-F, 8am-4pm.